Rainbow Commodore Accommodation Rainbow Bay is a 15 storey resort situated in quiet, peaceful Rainbow Bay, Coolangatta. Arguably, the most beautiful bay in the world! Embracing one of Queensland’s most alluring and safest swimming beaches. From this beachside Coolangatta accommodation it is just a short stroll to Rainbow Bay, Greenmount & Duranbah beaches, which play home to many surfing competitions (Quicksilver & Roxy Pro) with the best bay point outlook, renown for whale sightings during migration! Gold Coast Tours & Activities. 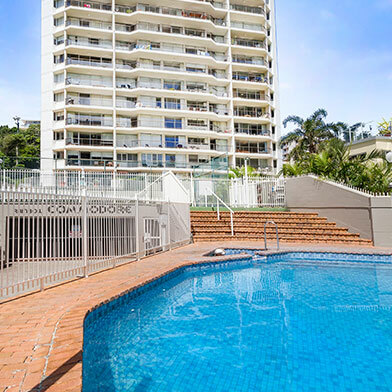 Ideal Coolangatta Accommodation beachside for that family beach holiday or a couples getaway with easy access to all that the Gold Coast has on offer. All apartments are individually owned and uniquely styled with quality furnishings and amenities. Beach/pool towels available to hire. Coolangatta is a family and couples favourite beach holiday destination with its beautiful and pristine sandy beaches.